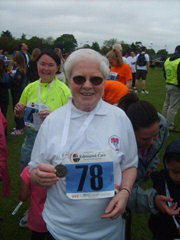 Sr Philomena Purcell participated again this year on behalf of our charity. This was Philomena’s eight year raising €8.631 to date. Philomena raised €1,558 this year included in above amount. Philomena is a loyal fundraiser for marfan research. All at Marfans Research Foundation are extremely grateful to Philomena and the extraordinary generosity of her sponsors.